CHICAGO -- An Illinois congressman under scrutiny for lavish expenses, including redecorating his Washington office in the style of the PBS television series "Downton Abbey," announced Friday that he has hired private firms to oversee spending for his official and campaign operations. Acknowledging that at times that he may come across to his constituents as "out of touch," Republican U.S. Rep. Aaron Schock said he had reached a "point of reflection" and decided to change his habits amid a growing scandal over spending on flights and luxury items. In a hastily called news conference at his district office in Peoria, Illinois, the 33-year-old congressman said he has hired a local accountant to review office procedures, in addition to the two firms overseeing spending. Schock said the changes would "ensure compliance, orderly record keeping, and a system of checks and balances within each office." He said the moves were a part of an effort not only to improve the office "but also me personally." The Associated Press found that Schock used campaign donors' private aircraft at least a dozen times since mid-2011, tracking his reliance on those flights through pictures uploaded to the congressman's Instagram account. The value of those flights was more than $40,000. On Monday, Schock said he had repaid $1,200 for a taxpayer-paid flight to Chicago in November to see a Bears football game. 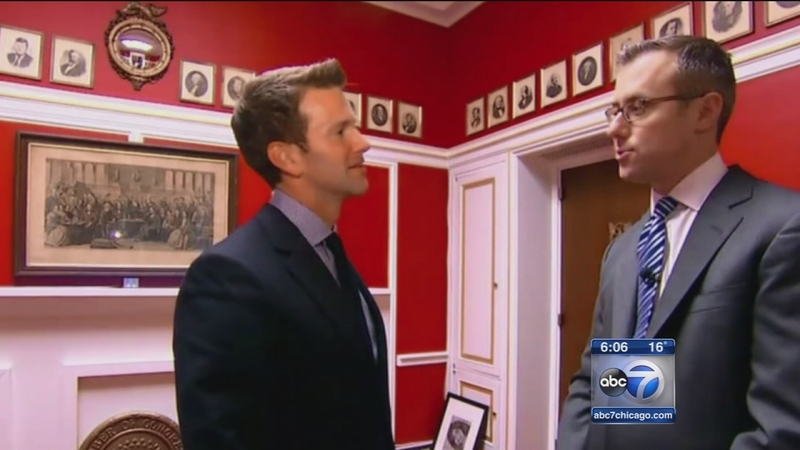 Last month, Schock said he repaid $40,000 for the "Downton Abbey"-inspired decorations at his Capitol office. Schock's other official expenses included concert tickets and mileage reimbursements, including a sold-out Katy Perry concert in June. "I have tried to balance being a young congressman and doing things differently ... with maintaining a level of seriousness on the issues of the day," Schock said. "I know some days I have failed at this." Lawmakers can use office funds for private flights as long as payments cover their share of the costs. But most of the flights Schock covered with office funds occurred before the House changed its rules in January 2013. Those earlier rules prohibited lawmakers from using those accounts to pay for flights on private aircraft, allowing payments only for federally licensed charter and commercial flights. A liberal-leaning group, Citizens for Responsibility and Ethics in Washington, had requested an investigation by the Office of Congressional Ethics. The panel reviews complaints against House members. "I have listened to the feedback from folks in my district and from the team of professionals I mentioned earlier," Schock said. "I believe you have to earn the trust of your voters every day and that's exactly what I intend to do."